It's 6AM and I'm packing the car for another annual cross country road trip from (red state) Arkansas to (blue state) Vermont. I was hired as a cross cultural trainer for new US Peace Corps volunteers arriving in Cameroon in 1987, and sometimes feel I never stopped. Can't resist posting my note to the AirBNB host where we stayed in lovely Leslie, Arkansas. She was the child of a hippie who grew up in the Ozarks and now lives in Seattle. Finding yourself in liberal Seattle must be like me finding myself in Vermont. Generally I'm very relieved to be away from "ignorant and proud of it" politics here in the southern midwest. But also I find myself very aware of my coastal liberal friends and our own confirmation bias and "profiling" of conservatives, and attributing to 'denial' what may be legitimate skepticism over 'solutions'. Consider yourself a Peace Corps volunteer from a red state. Confirmation bias. Profiling. I'm not immune to it. None of us can be. But when you walk a mile in another man's shoes - as I've done for a long time with the WEEE export entrepreneurs in emerging markets - you can sit on their jury. The blindness of NGOs to the studies that show nuance is nothing new. It's Captain Ahab. It's Scarlet Letter. It's Sir Gawain and the Green Knight. It's in To Kill a Mockingbird. It's Huckleberry Finn's crime. These great works are all about people who start a mission based on justice (like environmental justice) and consider themselves jurists and agents of conscience, but are deafened by their own conclusions. We need to keep it simple. 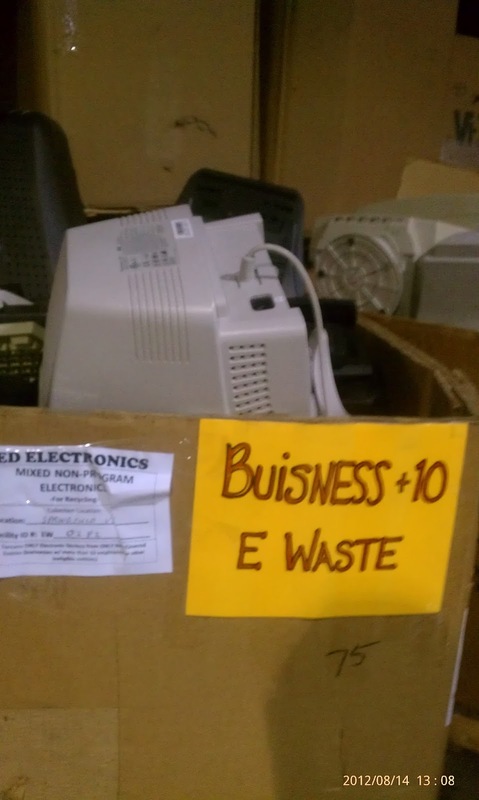 If I'm skeptical of your trade ban on used electronics as a "solution" (to what? poverty?) that does not make me a "denier". Let's find something else to agree on, a simple message that might appeal to rural and urban and OECD and non-OECD. The number of blog visits is up in 2016, compared to 2015. Hopefully that is a sign that I've been engaged more relevant topics. Views from Europe, India and Africa grew in number and duration. "Why We Should Ship Our Electronic 'Waste' To China and Africa" ran in Motherboard Vice five years ago. Klaus N. read it in Germany and decided to do a piece on it for 3Sat (German language equivalent of PBS, I'm told, which broadcasts in several countries). That led to a pretty steady dozen or so readers in West Europe. This year, the number is close to 100. Some of the attention is probably "reflected from the mud". 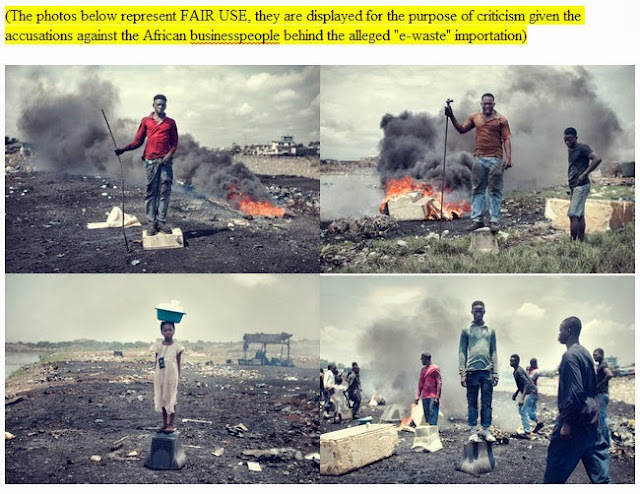 Kevin McElvaney published the arm-flailing Mike Anane's absurd claims about Agbogbloshie ("the biggest e-waste dump on earth") Sodom and Gomorrah? Fishing as a Boy?... "), which led to interviews in all kinds of German news, and led to a flurry of follow up visits to Ghana by other aspiring documentarians. A textbook case of photojournalism running off the reservation without a hint of datajournalism to support it. The posts here which provide links to World Bank and other data seem attractive to the photographically inspired. In any case, Fair Trade Recycling is now a curiosity, if not a known quantity, in Europe. I'm preparing my presentation for ICM, 16th International Electronics Recycling Congress IERC 2017 in Salzburg, Austria, where I will sit side by side with Jim Puckett of Basel Action Network on a panel in front of hundreds of European regulators and researchers. I offered to do a presentation on how incredibly small and insignificant our topic is. How bland, how navel gazing our concerns are from the perspective of the slum dwellers we wring hands and handkerchiefs about. The background of the landscape photo I took shows the Old Fadama slum in central Accra. The dump is across the lagoon. And the most photographed, if not the largest, ewaste dump on earth is there in the center, on this side of the lagoon. No kidding, folks. This is it for wire burning. I got photos of photographers on that tiny, barren spot, posing young slum ruffians on top of some of the few dozen devices found scattered on the lagoon bank. See the "close up" of the same site at bottom... same tent in the background. As we near the end of 2016, and I review the engagement of the published blogs this year, it appears I need to update readers on the apparent stonewalling of our requests for information and review of MIT Senseable City Labs "collaboration" with Basel Action Network's GPS tracking of used electronics. I slowed down on the reporting in part because I had to engage with actual attorneys... MIT's, one of the "collateral damage" processors at Hong Kong's Eco Park, and my own. Obviously Hong Kong Environmental Department attorneys must be involved in responding to BAN's accusations (in China Daily) that their legal opinion - that printer scrap is not hazardous waste and not illegal to import - was against international law (according to USA-based BAN.org). Also a few of the companies mentioned in the report as being in the "chain of export" cautioned me about the "Streisand Effect". If reporters were by and large (other than PBS and Time) ignoring BAN's study, why risk elevating it? Well enough time has gone by for an update. MIT did not confirm or deny that a copy of my letter was given to its Ethics Review Committee. They sent it instead to Basel Action Network, the organization we thought entangled MIT in the ethical research questions to begin with (and who I did not address in the letter for that reason). Evidence has come to light that BAN had the ability to control the outcome in real time. This risk was not addressed by Carlo Ratti's team. BAN admits they knew where the devices were at intermediaries DURING the study. My company shipped printer scrap to another shredder, on several occasions, which pays BAN e-Steward royalties. We shipped printer scrap to that company immediately before the load (also to the Chicago area) the month before the tracking device came to Good Point, and a month after the device was shipped to the company that exported it. DURING THE MONTH IN BETWEEN the company which pays BAN royalties stopped accepting our material! We had actual cancellations of deliveries of printer scrap while the tracking device was at our property! At the very least, this seems a strong reason not to publish the names of unwitting and unwilling test subjects involved in the chain. While we don't know about this particular case, we do know some in the chain were more "witting" than others. I revealed last summer that at least some E-Steward companies knew the trackers were in the field, and at least some were involved in selecting which devices to track. This does not prove that BAN colluded with or warned their sponsor company that we had a device on our property, or that the information resulted in the delivery being cancelled until the device was off our property. That information is "continuously unknown". It does show the need for MIT's existing rules on testing of unwitting subjects, and rules on conflict of interest. And there can be no bigger example of a conflict of interest than between Basel Action Network and Fair Trade Recycling. What's the value added of an apparently contemplative tweet? Does it persuade anyone? My latest theory is that 100% of what we publish will be analyzed by artificial intelligence (either supercomputer or a genetically modified giant human brain) in 50-100 years, and that every single tweet and blog will be filtered through a consciousness we can't imagine. More on that below. In the wee hours of the morning, I lay thinking about other people, and how they became a part of me. How I learned from people's personalities, kind of like you learn words or vocabulary, or a foreign language, by listening to others. Focusing on them. Getting what they want us to get out of what they are saying, what they value. This could have been a chapter 9 in "Collateral Damage" series started in October. Original Equipment Manufacturers have been at ground zero in the "Ewaste" War. They are targets, and they are targeters. They are allies and adversaries. Interested parties with a stake in the game. My suggestion is that we just stop using the term "Third World" and "Lesser Developed Country" altogether. There are certainly places with incredible poverty. Like, say, the poverty I knew about in the Ozarks as a kid. Not that I suffered it, or even that many people I know suffered it. But it was in our rear view mirror, through our parents and grandparents, who lived in the Ozarks during the Depression and before electricity, running water, and hospitals were commonplace. I've posted a few times about my mom's father, Clarence E. Fisher, pictured above. This was a photo I took as a teenager. 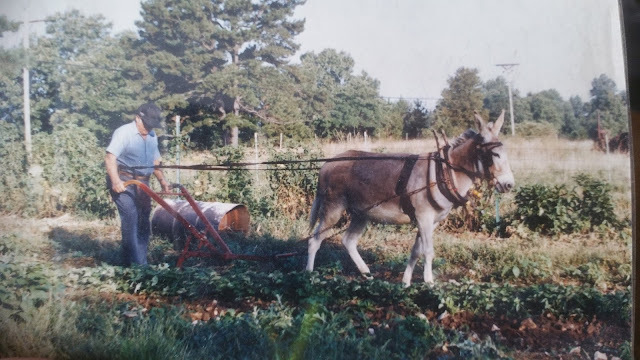 He had a tractor, but had gone back to his mule ("Jenny") for old times sake and found that he really liked ploughing that way. He was a subsistence farmer and an excellent carpenter and painter. And someone who convinced me it was going to be really important to me the rest of my life to know how everything worked, and how to fix stuff. General reaction to a lot of posts on Facebook this year: People care about stuff, and they post what they care about. And they post about what other people care about. It's curious how many of my friends posts demonstrate they care about what other peoples value systems are. Many of us are very certain of our own value system, what we care about, and express fear or anger at a society that doesn't seem to care about it. Or perhaps the post is an ad (I posted about giraffe extinction yesterday) to get people to care about what we personally care deeply about. This is kind of a hoot. Dr. Josh Lepawsky found a paper I wrote my first months in the job at MA DEP, 30 years old, 25 years ago. It got Boston Globe front page coverage because of ricochet. A loud PIRG vs. Plastic Packaging Industry referendum fight had thrust "recycling" into a spotlight, and the value of "recycling" rather than the packaging policy itself, was occupying the center stage. Critics of the referendum were attacking state recycling policy, and proponents of the packaging laws were wrapping themselves in recycling like it was mom, apple pie, and the American flag. To defend recycling as a policy, I tried to explain that there aren't "good markets" and "bad markets". There are "buyers markets" and "sellers markets", and from an economic perspective, the paper mills, glass furnaces, metal refiners, etc. were adding more value than "waste diversion" from landfills. So I got some secondary data on the recycled paper mills etc. that I'd supplied as a recycling collector, added up their employees, and explained the multiipliers. The paper doesn't do so explicitly, but buried in it was my first realization that paper mills might be worse "neighbors", environmentally (odor, water effluent) than an incinerator or landfill, but they created so many jobs that the neighborhoods surrounding those mills were advocates. Environmental enforcement was linked, geographically, to real estate value. Likewise, those same jobs, which would disappear in Massachusetts if the tissue paper had to be made from trees, were far more important economically than the value of a ton of paper at a recycling center. I was initially accused of writing the paper to influence the referendum (and threatened, professionally). I responded that the paper mill employees and those like me who'd been driving paper recycling trucks were kind of bemused... I might next leak the number of laundromats in MA and see if that got in the Globe. And four years later, this paper was called upon to rebut John Tierney's "Recycling is Garbage" rant, which in part arose out of the very anti-recycling statements being made during the Packaging Referendum Wars (which employed many Bottle Bill Battle generals... history for another blog). Anyway I long ago lost track of the paper, Josh found it at the MA State House library. Blog Status December 6, 2016. Catching up on editing 4 blog articles (from "Collateral Damage" series) and one magazine article, and preparing for my presentation at ICM in Salzburg, Austria. Also getting all my vaccinations for the re-visit to Ghana. I'm double checking things from the draft Fair Trade Recycling report (2015 visit). 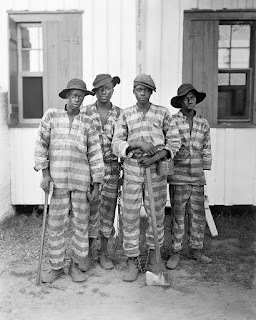 1- Does something bad happen at Agbogbloshie? Bad for health, for the environment, etc.? 2- If something bad happens, is it related to unfair export and import trade? 3- If something bad happens, due to unfair trade, is it illegal or a "loophole"? 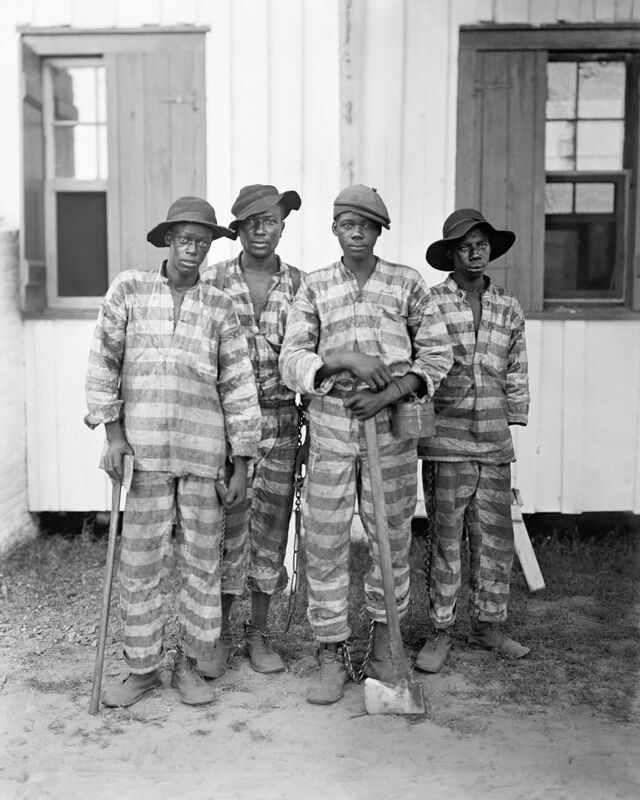 4- If something bad happens, due to unfair trade, and it is illegal, should Joe "Hurricane" Benson and other Tech Sector African businesspeople pay fines or go to prison for it? The answer to the first question is yes and no. Or rather, some bad things happen, and some good things (better than if the goods were in the USA or EU) happen. The worst thing is probably the men who burn wire and then use their bare hands to scrape metal out of the dirt and ashes. The earth there will be contaminated by lead. Some of the lead is from automobiles, some from leaded casings in older electric wire (not computers). If they aren't washing their hands really well, they are likely to suffer consequences. The good thing is that the goods are used for far longer than westerners use the goods. Even after westerners have finihsed using the electronics, Africans will tend to reuse them twice as long as that. And hand disassembly is better for the environment than shredding. And the cost of achieving internet, phone, TV, radio and other teledensity measures, per African is a TINY FRACTION of the upstream environmental cost per capita done by Western countries. And most of THAT damage, from mining, occurs in places like Africa. 2 - No. The junk in Agbogbloshie is far more likely to be collected from African city residents and businesses after 10-20 years of use than it is to be imported. The people saying that it came from sea containers being dumped to avoid recycling costs are making it up at best, and in some cases lying. 3. Not under Basel Convention Annex IX. But - in reaction (over-reaction) to lies about #2, some EU countries have passed stricter laws. It's like if you thought bananas were poison, and passed a law against selling bananas... yeah, banana sellers would be criminals. But seriously. 4. No. This was a witch hunt.